Chinese water deer, (Hydropotes inermis), very small Asian deer of the family Cervidae (order Artiodactyla), native to fertile river bottoms in Korea and the Yangtze River (Chang Jiang) valley in China. It is the only species of deer in which males lack antlers; instead, they are armed with long, curved, and sharp upper canine teeth that protrude from the mouth. These tusks may exceed 5 cm (2 inches) in length. The water deer is also the only deer with inguinal glands. 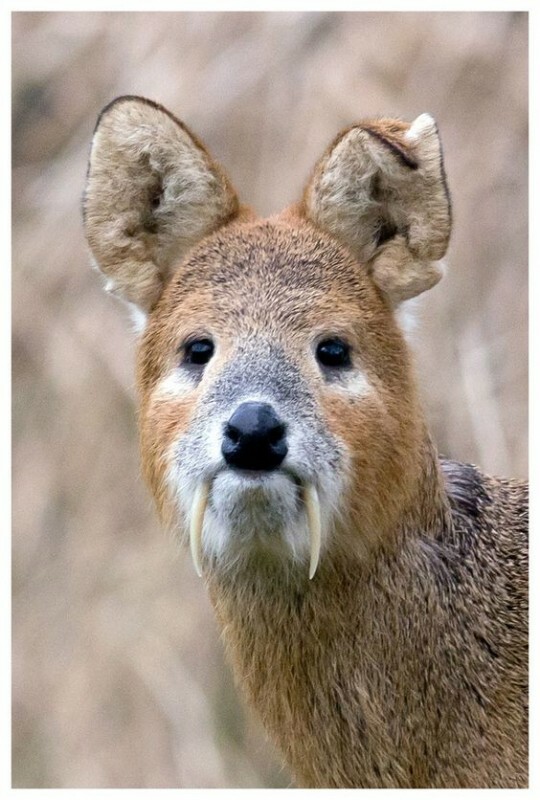 Although water deer resemble extinct primitive deer in lacking antlers, they evolved from ancestors with antlers that were subsequently lost. Their morphology indicates that they are New World deer. Males stand about 50 cm (20 inches) tall at the shoulder and weigh up to 13 kg (29 pounds); females weigh up to 11 kg (24 pounds). They have a rather uniformly coloured coat, yellowish brown above and yellowish white below. The tail is very short, and there is no rump patch. Their coarse, thick coat and fur-covered ears are adaptations to cold, snowy winters. To evade predators, water deer rely on hiding and on bursts of quick, rabbitlike, bounding flight. Generally, they are encountered alone; observations of captive animals suggest that males use their tusks to defend territories. Water deer prefer the lush vegetation that grows along river bottoms; there they eat a surprisingly large amount of coarse-fibred grasses that serve as both food and cover. The breeding season extends from early November to February, and the fawning season lasts from late April to June. Water deer give birth to several young at a time. The fawns weigh less than 1 kg (2 pounds) at birth. They hide quickly and remain out of sight.